New users are often befuddled by how to place Room Tags in open-flowing areas. They quickly drop rooms into the zones of a plan, name them and keep moving. It isn’t until they review a Room Schedule that they realize that the data has been compromised. What is a Redundant Room? 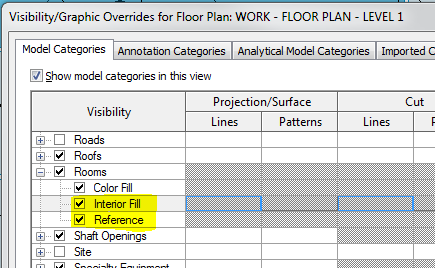 The previous post (link above) addressed ‘Not Placed’ and ‘Undefined’ rooms, which are rooms that have either been created then deleted (or created as data and never applied to the model) or were placed but have no complete boundary surrounding them. Redundant rooms occur when room elements OVERLAP each other. When redundancy appears in the room schedule, open a corresponding floor plan adjacent to the schedule, and turn on the Room subcategories of Interior Fill and Reference. 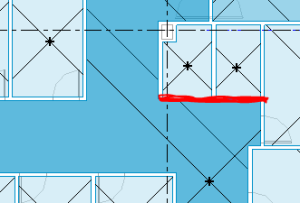 Most cases of redundant rooms happen because there needs to be a separate zone identified and tagged, but there isn’t a wall element in place to define the zone boundary. Add Room Separation Lines where zones should divide. I like to set up a Management (working) view that has the Lines subcategory of <Room Separation> overridden with a heavy lineweight and an eye-popping color, to make them easy to find and manage as the project layout evolves. 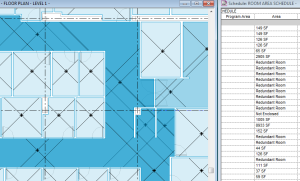 This entry was posted in BIM/Revit and tagged Annotations, Revit, Schedules, troubleshooting. Bookmark the permalink.